Do we have a candidate with any Confucian virtues? As our many past articles and our recently released book explain in great detail, the Chinese sage Confucius was a keen observer of the rise and fall of nations. In his day, these historical patterns were visible in the well-documented dynastic cycle. A strong leader would emerge and unify China; he would rule wisely and the nation would prosper. His successors tended to be lazier, allowing the bureaucracy and local nobility to fleece the citizens and rob the public purse beyond society's ability to sustain the cost of government. Eventually, too much would be stripped from the defense budget and the Mongols would invade, overthrowing the ineffective dynasty and putting the corrupt governmental hierarchy to the sword. If the Mongols were too weak, the people would rise up against their corrupt oppressors, leading to anarchy and civil war. There would then be a period of chaos before another strong leader put things back together again, and the cycle began anew. This is what we call the Confucian Cycle. It's easy to see signs in America of the cycle Confucius observed and predicted. Our Founders were men of virtue, our early leaders truly sought the best interests of all American citizens, and corruption and taxes were kept to a minimum. As a result, our Founders and their government were generally revered, and laws were usually obeyed. None of this is true today; the current confused state of the election illustrates how deeply in contempt the American people hold their elites and vice versa. Many observers have called out current condition "pre-Revolutionary." Not being masochists, we would prefer not to live through another revolutionary war. On the other hand, we also would prefer to live in peace and freedom as our grandfathers did. It is all very well to look at Confucius' teaching and nervously observe where we are in the cycle, but the true purpose of learning from history is so that we are not condemned to repeat it. 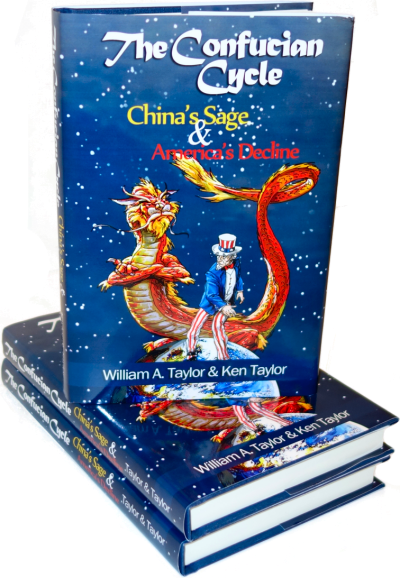 Is there anything the Confucian Cycle has to say which might help us break out of the decline - particularly since, unlike any time in Chinese history, we have the privilege of selecting our own leaders? As it happens, there is. What's more, there is an example of at least one aspect of Confucian virtue so clear and outspoken that we can't help but think the sage himself would approve. In medieval Europe, political thinkers in the pay of their sovereigns promoted the concept of the "divine right of kings." They argued that, since God decreed who rose and who fell and since the king was, in fact, on his throne, obviously the king had God's endorsement. Therefore, opposing the king's desires was to oppose God Himself. Confucius' view was somewhat more subtle. Confucius believed that the endorsement of Heaven for the Emperor was essential for tranquility, but he didn't consider the mere presence of a royal fundament on a gilded throne to be definitive proof of Heaven's approval. No, the "Mandate of Heaven" made itself known in peace, prosperity, and good government. This idea is not so very different from how American voters decide whether they approve of their leaders. If the nation was wracked by economic turmoil and war, the Emperor couldn't just demand that the people bow down to his Divine Right - Confucians would point out that the Emperor, through incompetence, had lost the Mandate of Heaven and deserved to lose his throne if not his head. How did a good Emperor make sure that his country was well-run? Confucius lived many thousands of years before modern telecommunications, and even today, China is very large. It took weeks if not months for messages to be sent from one end of the empire to another. Micro-management of far-flung provinces was impossible. In order to administer such a sprawling empire at all well, the Emperor had to preside over a regime that valued competence and virtue. Throughout most of China's recorded history, elevation to high office came as a result of passing grueling academic examinations which covered the principles of Confucian virtue as well as more obviously practical elements of management and public administration. In theory, anyone could rise to any level based on their own merits, and no matter how high-born, an incompetent would go nowhere. This system actually worked far better than you might expect. Even so, there were opportunities for fraud and corruption. It's easy to imagine how a smart corruptocrat might know all the virtuous right answers to pass the test, but run his department in a self-serving way. No doubt, such corrupt elites would pull any string or bribe a test adjudicator to make sure Junior got a good score no matter how dumb he really was. Thus, according to Confucius, the first and foremost job of the Emperor, if not his only job, was to oppose corruption. The Emperor had the authority to override the results of the test scores by raising up deserving individuals, and more dramatically, by executing officials who abused their authority. A good Emperor would seek out wrongdoers and publicly behead them in the sight of as many other bureaucrats as possible. Doing so regularly had a powerful effect on keeping everyone else honest - a result rooted in human nature which is still effective today. Only the Emperor had the credibility and power to deal with corrupt officials as they deserved. Without the occasional whisper of the ax, there'd be no force able to stop greedy bureaucrats from stealing the nation blind until the economy and the society collapsed. Therefore, a good Confucian Emperor had one and only one bullet-point at the top of his daily To-Do list: Execute corrupt, unjust, destructive government employees! We modern Americans do not execute people for abuse of office, although modern Chinese rulers have done so to good effect. There are, however, lesser penalties that can get the point across. For years now, American government employees have been paid far above the average worker's salary, enjoy vastly lusher benefits, and collect pensions private-sector workers can only dream of. Being cut off from the gravy train might not be literal death, but it would certainly seem pretty close. Various well-intentioned laws over the years have made it difficult to fire bureaucrats. However, the last six years of the Obama administration have been a vivid education in how to abuse, manipulate, and bend the current legal system out of all recognition in order to accomplish whatever you want. Regardless of the technical requirements of the law, where there's a will there's a way. Mr. Obama, if nothing else, has the will, whether it be defying the law to help illegal immigrants, illegally selling assault weapons to Mexican druglords to make our Second Amendment look bad, inciting thugs to riot while demeaning the police who protect the innocent, or manufacturing phony rights out of whole cloth so as to force the religious out of public office. What we need today is someone with the will and determination to force through his agenda as Mr. Obama does, but whose agenda is one of casting aside corrupt, useless, and obstructionist bureaucrats and government officials on every hand. That is what Confucius wanted all Emperors to focus on; that is what successful Emperors did, and it's also what many of our greatest past Presidents did when they were allowed to do it. He would vote for the man whose trademark phrase is "You're Fired!" because that's what a virtuous Confucian President would shout all day, every day, until our country once again became prosperous, free, and - in a word - great. And you thought an ancient Chinaman thousands of years dead had nothing to say about our modern political scene! Quite the contrary: Confucius has pointed the way to the Trump card which may just bring about victory for the real America.